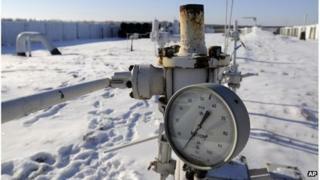 Gas and oil prices have risen amid fears the Ukraine crisis could have a damaging effect on one of Europe's main energy supply routes. But analysts say high European gas stocks will limit the turbulence. Gas futures climbed by up to 10% in early trading, while the benchmark price for oil rose by more than 2%. Traders are worried about the stability of supplies from Russia, which provides a quarter of Europe's natural gas, half of it through Ukraine. However, a relatively mild winter has reduced demand for heating fuel, with storage levels at the main gas hubs about 20% greater than last year. In Germany, Europe's biggest gas consumer and Russia's largest customer, stocks are at more than 60% of capacity, capable of satisfying 60 days of demand. Russia is Europe's biggest supplier of natural gas, but the continent has been weaning itself off dependence on its neighbour for the last decade. It now imports less than 30% of its natural gas from Russia, compared with 45% in 2003, according to European Union statistics. Europe is also less reliant on the Ukraine link, with improved gas infrastructure now meaning supplies could go via alternative routes in the event of disruption. The Nord Stream pipeline, which goes through the Baltic Sea to Germany, or another route to Germany via Belarus and Poland, are two options. Russian state gas producer, Gazprom, also plans to build another sub-sea pipeline - the South Stream - to bypass Ukraine by 2016. "Low utilisation means Ukraine's gas network is of lesser importance today than in the past," said US market analysts, Bernstein Research, in a note to clients. There are also doubts that Russia could afford to disrupt or cut part of its gas supply to Europe, which is worth almost $100m (£60m) a day. Analysts estimate it accounts for about 3% of Russian economic output. Russia's economy registered disappointing growth of 1.3% last year, and its central bank has lowered its own forecasts, anticipating growth of below 2% until at least 2016. Gazprom said on Monday that supplies to Europe via Ukraine were unaffected, but a previous Russian supply cut to Ukraine caused major disruption across the continent and pushed up prices significantly. In January 2009 Russia turned off the taps to its neighbour in a row over contract prices and accusations that Ukraine had been siphoning off gas meant for European customers. The two-week shutdown, during a very cold spell, resulted in severe disruptions across the continent, with more than a dozen countries without their expected supplies of Russian gas. Energy is at the heart of the commercial links between Russia and the European Union. Russia is the EU's biggest outside supplier of oil, and of coal and gas, which are important fuels for electricity as well as heating. Curtailing that trade is unappealing to both sides. Russia needs the income from its largest export market, and Europe needs the energy - though the timing makes it less vulnerable than it might be. A relatively mild winter is coming to an end, and Europe has healthy gas stocks. But energy is a battleground where neither the EU nor Russia wants to fight. Bulgaria, Serbia and Bosnia, who were almost completely dependent on supplies via Ukraine, were left with major shortages. Parts of Europe had to shut down industrial plants and domestic heating systems, find alternative sources of gas or switch energy plants to oil. Slovakia and Bulgaria considered restarting mothballed nuclear reactors. While traders say healthy European gas stocks would limit the impact of another shutdown, any disruption in the current crisis would almost certainly lead to a sharp rise in gas prices. "Shifts in the global energy market have left Russia with less of a grip, but this nonetheless remains important," said Michala Marcussen, an economist at Societe Generale, in a research note. Gazprom has already warned Ukraine that it may increase the gas price for Kiev after the first quarter. "The situation with payments is worrying," said Andrei Kruglov, Gazprom's chief financial officer. "Ukraine is paying but not as well as we would like it to. We are still thinking about whether to extend the pricing contract into the next quarter based on current prices." Concerns about one of Europe's key gas supply routes have had a knock-on effect on other commodities, especially oil, as demand for alternative fuels increased. The benchmark oil price, Brent Crude, rose to a peak of $112.10 per barrel in early trading, its highest since 30 December. Its rise is also due to concerns about oil supplies from Russia, one of the world's largest oil producers, as well as the impact of any disruption in the gas market. "Oil markets are reacting on the potential that the situation could worsen," said Ben Le Brun, a market analyst at OptionsXpress. "I definitely suspect oil will move much higher, if it actually comes to war." Meanwhile, on the gas markets, UK prices for next-month delivery climbed as much as 10%, with German and Dutch prices rising by a similar amount, according to ICE Futures Europe exchange. The unrest in Ukraine also sent the Russian rouble to a record low against the US dollar, prompting Russia's central bank to raise its key lending rate by 1.5%. As a result, the main index of Russian stocks, MICEX, dropped by 11%, with Gazprom shares slumping by 13%.